From the snout to the tail tip, from the whole lamb to the veal stew, from the innards to the steak - in volume 5 of the BEEF! series is about the complete and consequent processing of the whole animal. Whether on the open fire on iron crosses, the Asado style, or meat-boiled meat gourmets - the recipes and stories are different from the filet variety and present great for legendary nights at the open fire, in the sausage kitchen or in front of a smoker's oven. Beef, pork and lamb have so much more to offer! How does it come about that we limit our livestock almost exclusively to their backs, and what reasons are there to ask the butcher for stews, cooked meat and offal? - Band 5 of the BEEF! Series gives answers. In addition to background information, decomposition and preparation sections provide useful knowledge in order to finally look at larger pieces and unusual ones. 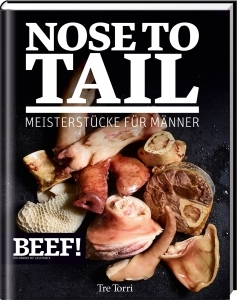 Nose to Tail is more than just a food trend: the whole animal plays the leading role!